“All of the buildings fell at once; no one first,” a man named Green Thompson told an investigator into the 1906 earthquake in Santa Rosa. He added the dust was so great on Fourth street he couldn’t see. In general, inquiries as to direction of fall of buildings met no definite answer…many told me that there was no direction of fall; that the buildings simply crumbled to the ground. The Masonic Temple and the Theater, I was told, fell so directly downward “that the debris did not extend beyond the walls 10 feet in any direction”…The great damage in Santa Rosa may be accounted for by the physiographic conditions and by the weakness of the buildings in many cases. The sand for mortar has usually been obtained from the creek and contains considerable loam. Some of the mortar seems to have been made with good sand and with cement…usually throughout the wrecked area the mortar taken from the walls is easily crumbled to incoherent sand by pressure of the fingers. It’s understandable that too much loam is undesirable (although there’s a 1903 researcher who says up to 10 percent dirt is actually beneficial) but we don’t know what the investigator meant by “considerable”, nor how he learned this. That goes to the heart of the question: before all the buildings fell down, did anyone know the mortar was weak? If it was always crumbly, that would have been apparent soon after the first brick buildings went up in 1883, and surely they would not have continued making the same mistake for another two years. Nor is this my first beef with the official report; it was superficial and littered with errors, as I’ve mentioned here several times. Besides apparently inverting a couple of digits for the population of the town (6700 instead of 7600) which exaggerated the scope of the death toll, it claimed there were “61 identified dead, with at least a dozen ‘missing’” without explanation even though no missing persons had been mentioned since the weeks immediately after the quake. In this case, I believe the investigator had important information in front of him but did not know what to make of it. A quarter-century had passed since those bricks were laid, during which there had been a revolution in the building trade. Victorian-American bricklayers, like masons around the world, were still using traditional lime mortar in the early 1880s; like bricks and building stones, it was permeable so an entire wall handled rain (and more importantly, frost) as if it was all the same material. Some of the drawbacks of sand-lime-brick was that it took a long time to fully cure and had to be repointed after 30-50 years. When quick-drying Portland cement came along, builders rushed to add it to their mortar; transcribed below is a little snippet from the 1883 Santa Rosa newspaper showing the contractor and architect arguing over the mixture to use for the foundation of the new courthouse. We don’t know the exact ratio used by other Santa Rosa builders at that time, but can assume they used a high ratio of lime to concrete, as was common practice. And here’s the other drawback to using the old lime formula – when it’s exposed to high temperatures it bakes, as the carbon dioxide is driven off and it begins to break down into calcium oxide (CaO), or as it’s better known, quicklime. If this is all correct, it rewrites another part of the 1906 Santa Rosa earthquake story – namely, the fire was far more intense than is believed. Lime-based mortar begins to break down to quicklime at around 850°C (1562°F) which is around 30 percent hotter than an average house fire. But if everything collapsed at once, it had to reach those temperatures after the buildings had fallen – which would mean that much of downtown was an inferno, at least for a short period of time. Delay meant death; death from the smothering dust; death from the cruel weight of beams, planks and stone; and worse than all, death from the cruel flames which were already bursting forth from piles of debris from fallen and partially fallen buildings. The belching smoke served to intensify the horror. The last bit of evidence I’ll submit is this: Look at any of the photographs from the following days, including the one below, and you’ll see only piles of scattered bricks – not even small sections of walls fell intact, which suggests the mortar completely failed, either while standing or while on the ground. This item wouldn’t be complete without its obl. Believe-it-or-Not! coda, but it’s not about Santa Rosa – it concerns the Notre Dame Cathedral catastrophe. Much of that day I spent weepy-eyed and watching the excellent (English language) coverage from France24. To fill airtime they aired snippets from various news items on the Cathedral from earlier years, particularly about the restoration that was underway before the fire. This brief segment about bad mortar repairs left me shaking. Anyone involved with old house restoration would recognize it as undesirable “tuck-pointing” – modern concrete being used to fill in gaps where old lime mortar has fallen out due to weathering. Because cement mortar is impermeable, water ends up trapped in the adjacent brick or stone which over time starts to crumble away, as seen on the video. I pray to the goddesses that some engineer in Paris is thinking about that, or an even greater tragedy may soon follow. S. Carle spoke in relation to using lime in the rockwork for the foundation of the Court House. He would like one barrel of lime to one barrel of Portland cement and three barrels of sand. The specifications call for one barrel of Portland cement to three of sand, no lime mentioned. He claimed that the use of the amount of lime spoken of will make just as good a job as to have it all cement. Mr. Bennett, who was present stated that the proposition of the contractor would result in doing just as good a job as the other, and that he had drawn the specifications in that way so as to have full control of the material that went into the foundation. A long and desultory debate ensued, and finally the matter was informally referred to Messrs. Morse and Proctor. A new building material called stone brick, harder than the hardest clay brick, is made from simple mortar, but a scientifically made and perfect mortar; In fact, a hydraulic cement, and the grinding together of lime and sand in a dry state — including, also, some alumina, which is usually present in sand — and the subsequent heating by steam, give the mixture the properties of the burned hydraulic cements at present in use.—Public Opinion. On Dec. 1, 1918, Grace Brothers’ brewery was closed on account of madness. Bryan was mainly a professional prohibitionist during the war years. When he came here that June he also claimed $50 million worth of food products were being used annually by brewers.2 At this point of his speech he usually harrumphed indignantly, “how can we justify the making of any part of our breadstuffs into intoxicating liquor when men are crying out for bread?” The brewing industry pushed back that under one percent of the nation’s grain was used in making beer, but that was another true factoid not heard in Bryan’s Chautauqua tent. Accurate facts weren’t important to his audiences who didn’t seem to mind that he was hammering simplistic either-or fallacies into their poor, soft skulls; they went away thinking it was a choice between closed schools or open saloons, bread for starving war orphans or a nickel beer. They were given the impression that making alcohol – or drinking it – was both unpatriotic and shameful. But Grace Brothers’ wasn’t forced to stop brewing because of an actual shortage of coal or pressing demand for flour or the eloquent lips of William Jennings Bryan. It happened because by the end of 1918 most Americans were nuts. This article is part of a series on the 1920s culture wars, an era with numerous parallels to America today. This chapter concerns the origins of 20th century “fake news” – propaganda created in the U. S. during WWI. Some came from the government, intending to whip up support for the war, stir hate and fear against Germany and sow suspicions about German-Americans. The crusaders, who hoped that Prohibition would soon turn America bone-dry, wanted to shutoff access to all forms of drink and force the public to embrace their moral standards. 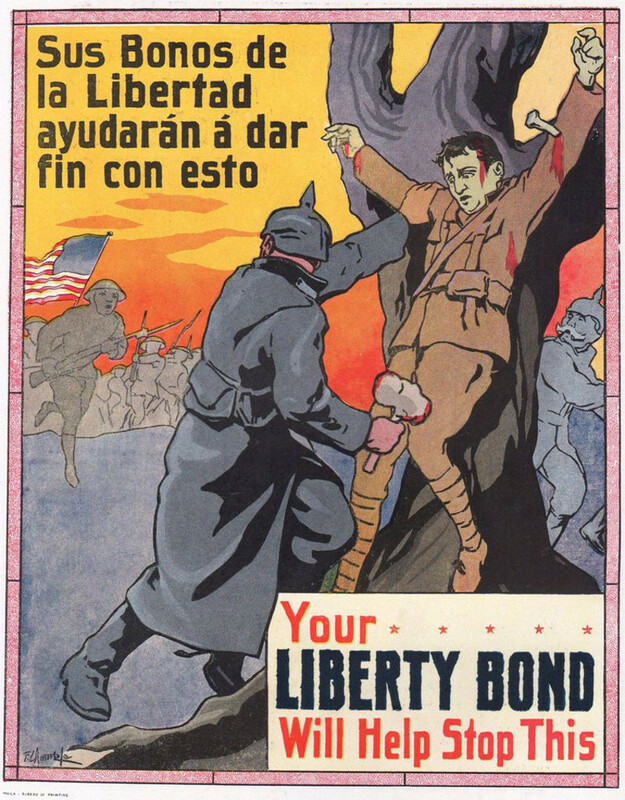 In 1918 the government and the anti-alcohol forces virtually merged. The Anti-Saloon League – the wealthiest and most powerful of the prohibitionist groups – not only wrote critical parts of the Volstead Act legislation but stage managed the Senate Judiciary Committee investigation into the German-American Alliance, paying witnesses for testimony. 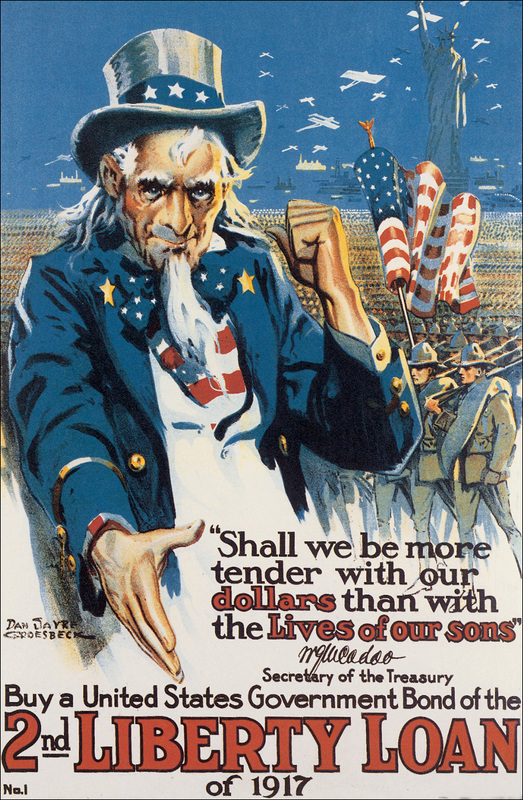 At the hearings the Alliance was painted as a front for the brewer’s trade group, which was itself condemned for placing editorials against the U.S. entry into the war and others against prohibition. ASL leader Wayne B. Wheeler argued at the time this showed the brewers were acting as a subversive fifth column and the government should seize all breweries owned by German families as “enemy alien property,” regardless of whether the owners had become naturalized U.S. citizens. Some of the propaganda efforts by the prohibitionists were clumsy (they tried to rebrand beer as “Kaiser Alcohol”) but leaks from the Senate committee served to drag the Alliance/brewer patriotism story out for months. 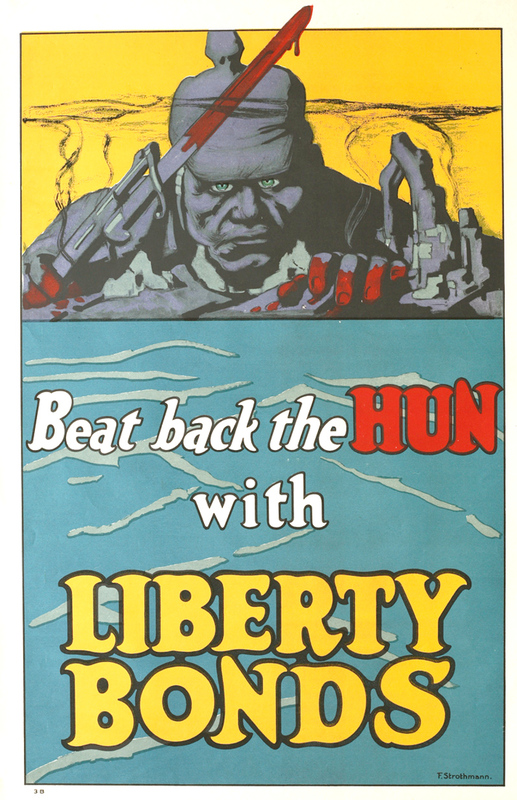 Speakers for ASL also effectively kept reminding the public that the names Busch, Pabst, Schlitz and Miller were all German – and President Wilson’s propaganda office, the Committee on Public Information, already had spent a year shaping public opinion to cast everything involving the “Huns” as sheer evil. 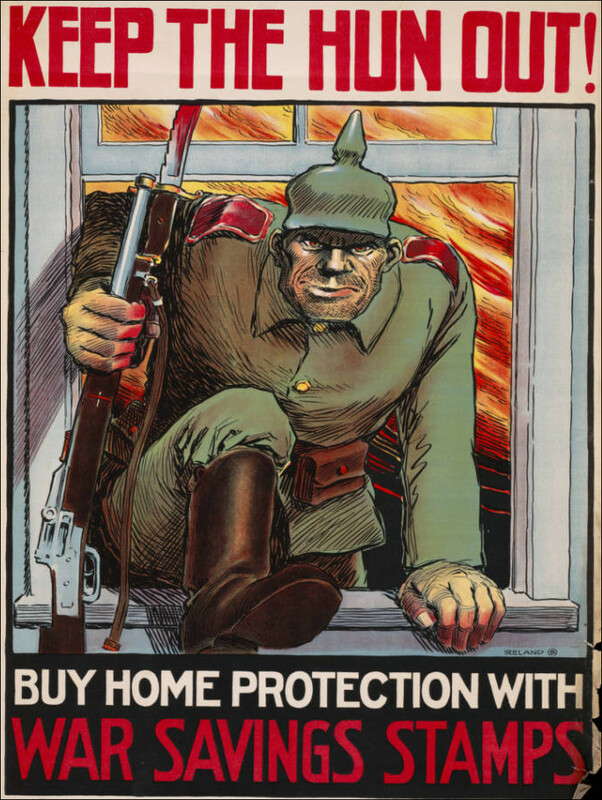 You’ve seen WWI propaganda posters; everybody has. There’s a small collection at the end of this article but do a Google image search and hundreds will turn up, along with some Photoshopped knockoffs which look like the real thing (Bitcoin people are particularly adept at this). But I invite Gentle Reader to try to imagine the power of seeing them for the first time. Close your eyes. It’s 1917 or 1918; there is no internet, TV or radio; movies are silent and black & white. You read newspapers for entertainment and often probably see a copy of Saturday Evening Post, Collier’s, Leslie’s Weekly or another popular slick magazine, but aside from their color covers the illustrations inside are like the newspapers, in black & white and the ads are heavy with text and light on graphic design. Ho-hum. Then one day you’re downtown and in a store window is a poster like nothing you’ve ever seen before. The colors are bright and alive; the forced perspective makes people seem to pop out of the drawing. There are only a handful of words, but the image is so powerful it makes any more unnecessary. Holy moly! It was staring him in the face. Such a slaughter as Germans prize. Every few days there was a newspaper report about a German spy being arrested, sometimes locally. Not long after the U.S. entered the war, the Sonoma county District Attorney and law enforcement officers swooped down on the Tyce family, who had a place near the peak of Hood mountain. A neighbor turned them in because he thought it was suspicious that they had a radio antenna and were foreign-born. It turned out father Ludwig Tyce was a Swiss-born chemist and he had bought the radio for his 14 year-old son. As it was 1917, there were only experimental broadcasts by voice so he was obviously listening to morse code. Although there was no transmitter on the rig the police confiscated it anyway. There was quite a large story on this in the PD, but no followup; the paper was silent on whether the kid ever got it back. Everything was suspicious. In Geyserville, a man and boy were seen “throwing boxes of an unusual looking mixture,” according to the PD. That was not long after a 59 year-old naturalized German-American was arrested near Vineburg on suspicion of being a German spy. They found he had a map of the Valley of the Moon and “Deputy Murray also found a German iron cross in his valise, and other articles. Then there were a number of letters and pieces of writing. The arrest is regarded as an important one.” Since he had emigrated to America in 1880, the only time he could have been awarded the medal was in a war fought when he was twelve. This constant drumbeat of hate and fear had horrific consequences. 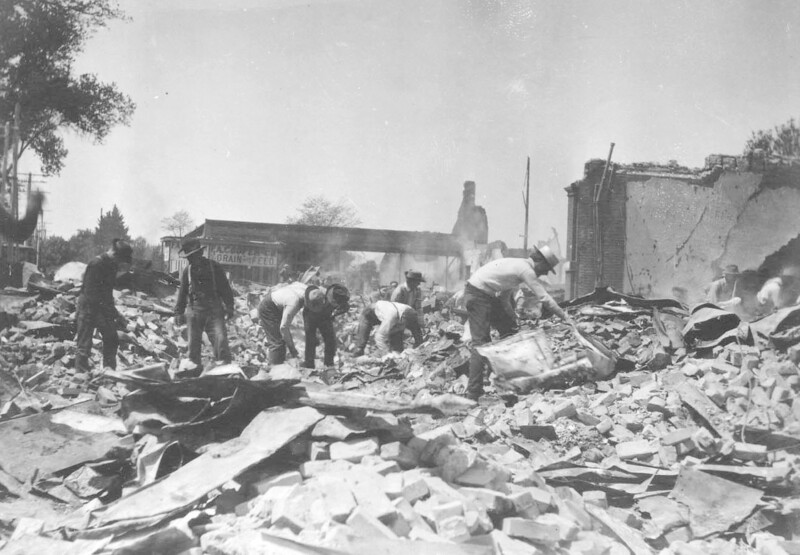 There was vigilantism; in April, a man rumored to be a German spy was lynched in southern Illinois (a town about the same size as modern Sebastopol). He was abducted by members of the local “Loyalty Committee” and forced to kiss an American flag at intervals as he was marched barefoot through the streets to the place of his murder. Some resources claim there were other lynchings and tar-and-feathering of suspected spies, but I can’t confirm – although it would hold no surprise. 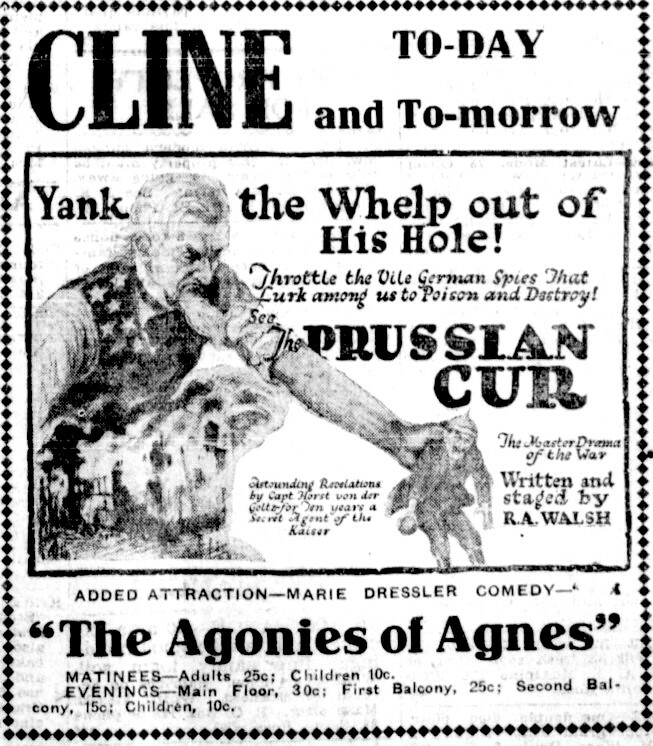 There were also several movies about espionage in the U.S. in 1918, most notably “The Prussian Cur,” described as a docudrama that was a “mighty panorama of the war…reveal[ing] the menace of the German spy system in America.” The film included scenes of an Allied soldier being crucified by Germans. 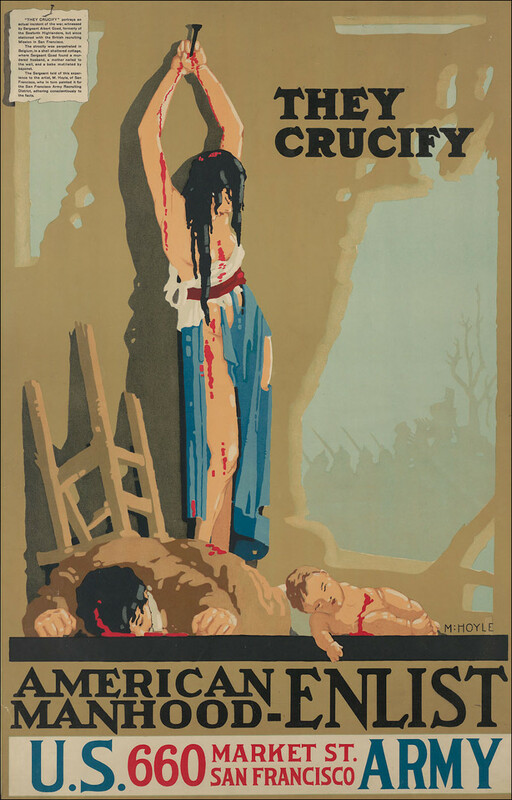 With its heavy-handed Christian symbolism, posters were also made of German soldier performing crucifixions, as shown below. The story was certainly a myth; the victim was first supposed to be British, then Canadian, and it was never clear where and when it supposedly happened. But the story that sent down deep roots in Sonoma county was that German agents were putting ground glass in bandages, flour, sugar, candy and pretty much everything else. Some kinds of chewing gum, specifically Tutti Fruitti brand, were pulled from the shelves. In Eureka ground glass was supposedly found in the Red Cross workroom; in San Rafael two women said they found it in packages of macaroni. In March the Sonoma county DA got involved after being sent four samples of “contaminated” food. He told the PD he found some sand (“enough to catch in the teeth”) in the cornmeal and bread samples, but that was it. The paper followed with an editorial assuring readers there was nothing to worry about and that the story had originated in Arkansas, where a disgruntled baker had inserted glass into a loaf of bread in order to screw over his boss. Oh, you sad deluded souls; you did not understand that once the righteous crusaders of morality had gained an inch of ground they would never yield. The Grace Brothers’ business would survive – and even thrive during Prohibition, according to the Grace family history website – by making soda pop (they were a Pepsi-Cola bottler) and near beer, but it would be almost fifteen very long years before their traditional and delicious suds flowed again. NEXT: WILL WINE COUNTRY SURVIVE PROHIBITION? 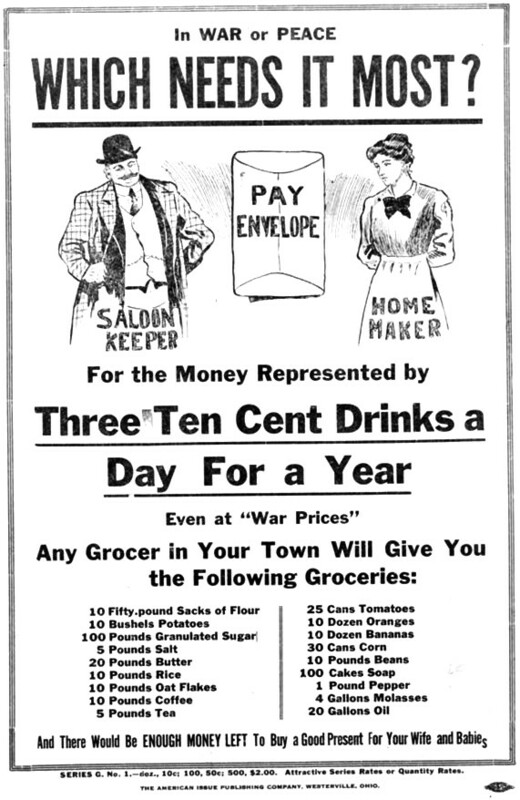 1 At the start of 1918 the White House ordered all non-essential businesses to shut down for five days because of the “coal famine.” This left most cities with only grocery and drug stores remaining open; in some places schools closed for weeks during the winter due to lack of heat or curtailed hours because there was no electricity. After the government had nationalized the mines and the railroads, however, coal shortages became far less of a pressing issue. According to the 1918 Fuel Administrator’s report, breweries used about 3.3 million tons of coal the previous year. 2 Before the breweries were closed because of the coal excuse, they already had been socked by the Fuel Administration; in September 1918 the sale of grain for making any form of alcoholic drink was prohibited. 3 Prohibition: The Era of Excess by Andrew Sinclair, 1962. This is by far the most thorough book on the events leading to Prohibition. WHAT FEDERAL OFFICIALS regard as a most important seizure of a complete radio outfit was made Saturday afternoon by District Attorney George W. Hoyle and Sheriff Jack Smith on Hood Mountain, fifteen miles from Santa Rosa. With the officials at the time were Deputy Sheriff Chris A. Reynolds and Deputy Fish and Game Commissioner Henry Lencioni, the two latter having been sent to the scene early Saturday morning to make the direct investigation which resulted in the discovery. The taking of the radio plant — most complete in all its attachments — crowded Sonoma county into the fore as featuring what was regarded by the officials as the most important war happening of the day on the Pacific Coast. Such was the opinion of United District Attorney John W. Preston when informed by District Attorney Hoyle as to the seizure. Preston had Hoyle tell him the details immediately over the long distance telephone Saturday night. Tho United States Attorney stated that he would at once communicate with the radio officials of the United States government in San Francisco and later would inform Hoyle as to what further steps would be taken. Later in the night Preston communicated that Assistant United States Attorney Caspar Ornbaun would be sent up to Santa Rosa on Sunday morning to meet Hoyle and Sheriff Smith and take up a further investigation. It was also hinted that arrests might follow, this latter information, however, not coming direct from the government. At the time of the first visit of Deputies Reynolds and Lencioni, Tyce and his wife, daughter, son, son-in-law, all ignored any suggestion that the wireless was there for any improper use. Tyce declaring that the expensive radio set had been bought by him for his son, Roland, a sixteen or seventeen-year-old lad, with a reputation of being a clever amateur wireless operator. When seen Saturday evening, after the wireless had been brought to the District Attorney’s office in the courthouse, by a Press Democrat representative, District Attorney Hoyle (it being understood that some important details are withheld and will be so by the federal authorities) it was ascertained from him that about two weeks since information was placed in the hands of the District Attorney by a person whose name is withheld to the effect that suspicion pointed to the fact that a wireless station had been established or was to be set up on the Tyce ranch. District Attorney Hoyle told his informant to be careful and if he had any further suspicions to communicate to do so. A week or so elapsed and the same man called upon the District Attorney confirming in a measure his former suspicions. About the same time Sheriff Jack Smith received a communication from an official source telling him of the supposed presence of a wireless on Hood Mountain, the Department of Justice having received some information to that effect. Sheriff Smith and District Attorney Hoyle “got busy” and it was agreed that Deputies Reynolds and Lencioni, under the guise of looking for poachers, should visit the Hood Mountain ranch section. Saturday morning they proceeded cautiously and climbed to the highest position where they could overlook the Tyce place. They had field glasses and other equipment with them. With the aid of the glasses they were able to detect the aerial on the Tyce ranch. The officers then went to the ranch. County Councils of Defense Urged to See That People Are Not Allowed to Be Misled by the False Sense of Security and That German Supporters and Sympathizers Are Hunted Down as Venomous Snakes. San Rafael, Feb. 9.— Evidence of a diabolical plot, presumably the work of enemy agents, to bring agony and death to unsuspecting persons, was revealed here today when Mrs. R. L. White and Mrs. C. D. Hammersmith of San Anselmo brought to Sheriff J. J. Keating three packages of macaroni in which quantities of ground glass had been embedded. The women said they discovered the glass particles by sheer chance while cooking the macaroni. The paste is the product of a Cleveland concern and was purchased in a San Anselmo grocery. Tells of Reports in Circulation and the Work of Tracing Them Down, and Urges That There Be No Undue Excitement Aroused in Community. “In justice to those engaged in business and also in justice to the general public of Sonoma county, I deem it my duty to make a statement relative to certain reports which have been circulated to the effect that glass had been found in cornmeal, bread, cake and other foodstuffs. During last week four of these cases were reported to me with samples of the foodstuff in which ground glass or pieces of glass were supposed to have been found. “I immediately took up the matter of an investigation of all these cases as rapidly as possible and forwarded the first samples which I received to the University of California for analysis. The other samples brought in I carefully examined myself. I have not yet received a final report from the University of California relative to the sample sent there, but I have made a personal examination of the other samples submitted to me. Out of these samples which I examined in one case I found absolutely nothing of a foreign nature. “In the case of some bread which was submitted to me I found small grains of sand. Just a few. yet enough to catch in the teeth and cause one perhaps to be suspicious if they did not know what these small particles were. In the case of some cornmeal which was submitted to me I found quite a quantity of sand, but in none of these did I find any trace of any glass whatever. The presence of the sand in the cornmeal is to my mind easily accounted for by the fact that this meal was from corn which had been taken to the mill and ground…The few grains of sand found in the barley bread which I examined might be accounted for by a little dirt in the bake room of the bakery where the bread was produced. “At any rate, from my investigation thus far, I feel that there is absolutely no occasion for anxiety or uneasiness in regard to glass in any food products of this kind in this locality. Important Evidence Discovered Among Effects of Alleged German Spy Arrested Near Vineburg Friday by Deputy Sheriff Jack Murray. The Press Democrat mentioned Saturday morning the arrest by Deputy Sheriff Jack Murray on Friday morning of a man named Wilhelm Peterch, near Vineburg. The man was arrested on suspicion of being a German spy and was detained in jail here, pending the arrival of a deputy United States Marshal. Among the man’s effects on the ranch on which he was arrested was a carefully prepared map, which he is said to have made, showing the railroad tracks through the Sonoma Valley from Glen Ellen to Sonoma, the county roads, the bridges, the hills and valley, the principal places, including the Jack London place and the Spreckels place, and other points. Deputy Murray also found a German iron cross In his valise, and other articles. Then there were a number of letters and pieces of writing. The arrest is regarded as an important one. It isn’t pleasant to think of ground glass in our digestive machinery. Maybe that is the reason why the scare has gained such headway. Sensitive people see glass in purchased foodstuffs where there isn’t anything of the sort. The government committee on public information announced the other day that federal experts, out of more than two hundred cases they had investigated in various parts of the country, had found only one genuine case of ground glass in foodstuff. That was at Fort Smith, Ark. It involved only one loaf of bread, and the offense was inspired, not by pro-German malignity, but by the desire of an aggrieved baker to hurt his employer’s business. [illegible microfilm] stronger statement still. It “has followed the elusive ground glass story from Maine to California and from the Lakes to the Gulf for the past four months,” in co-operation with the Intelligence bureaus of the war, navy and justice departments, and in the thousands of cases that have been reported has found but one genuine case. The experience of the New York City authorities has been just as conclusive. Occasional fragments of glass have been discovered in food, due apparently to carelessness or accident, but not a trace of ground glass. Geyserville, May 31—The first of the week considerable anxiety and excitement was experienced in and about town by the actions of a man and boy — strangers. These people traveled about town and even out a mile or more throwing boxes of an unusual looking mixture called salve. In addition to this, the man was very much interested in knowing all about the source of the town water supply. In this day of spies and Huns such questioning by total strangers aroused much suspicion. The county authorities were notified and Phil Varner sent to investigate. Mr. Varner seemed to think there was no cause for alarm, so the affair was dropped though many persons have been afraid of poison in the water. At the Big Santa Rosa Brewery Saturday Night the Brewing Ceased Until Fuel Administration Lifts Ban. Saturday night the brewing of beer ceased at Grace Bros. Santa Rosa Brewery, as it did in every other brewery throughout the nation in accordance with a prior order of the government that brewing of beer must cease on December first. As a war conservation measure for the saving of food and fuel, it was thought that possibly now that the armistice is signed and peace is coming that the order will not be in force for any length of time. At any rate there will be no shortage of the refreshing draught made from the beer blossoms at the local brewery as all the big cooperage is filled and there is sufficient supply on hand for several months of winter consumption. At this time of the year there is naturally a falling off in the amount of beer consumed.